Summer is all about glorious and colourful vegetables and the ones I planted in mamma’s backyard in spring are ripening nicely now that it has warmed up. I have a thing or two to learn about gardening though….This year I tried to plant the zucchini plant in an appropriate place, far away from other plants as it has a propensity to take over everything (last year was a bit of a disaster). Well clearly where I planted it was not sufficiently far away. Once if not twice a week I need to trim back enormous leaves that have taken over two neighbouring tomato plants as well as the borlotti beans. Happily however it is producing zucchini at an alarming rate. Tomatoes, zucchini, eggplant and basil all go together so well and all are ripening at about the same time. 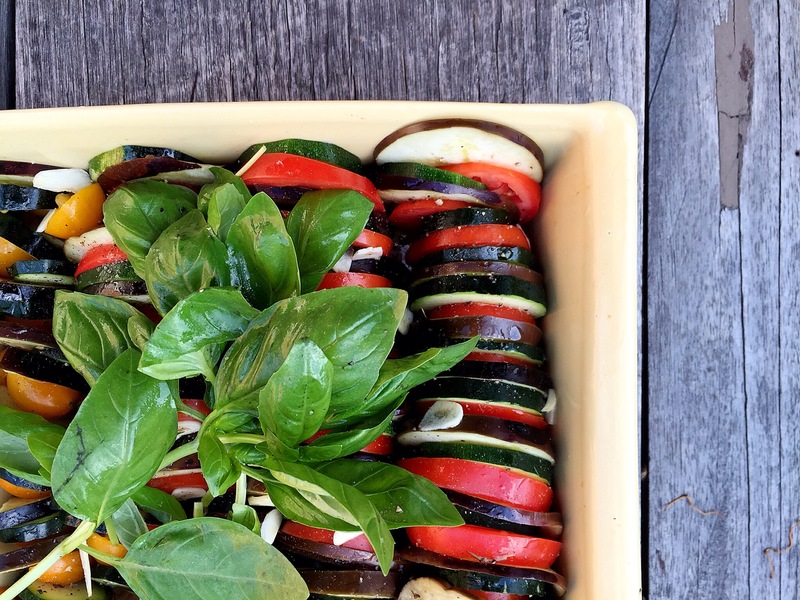 I saw a beautiful photo on Instagram a few months back of a round baking dish filled with circles of alternating thinly sliced and baked vegetables – tomatoes, eggplants and zucchini. It looked visually appealing and was definitely on my “to do” list. 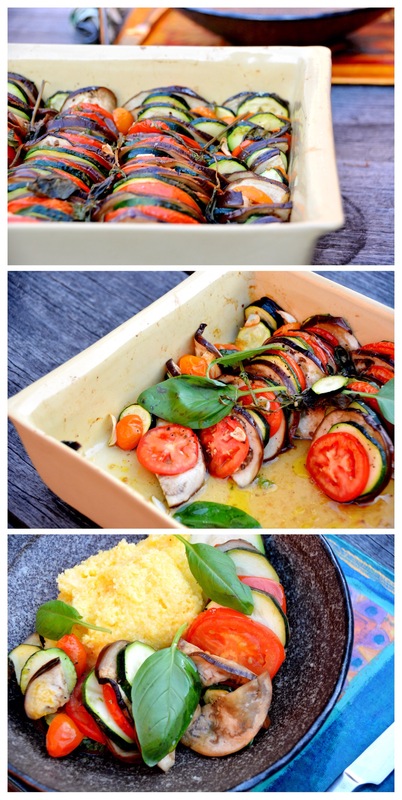 I later found a recipe for the dish in Mimi Thorisson’s divine new book “A kitchen in France” and discovered that it is called vegetable tian, and as Mimi writes “is a simply gorgeous ratatouille-like dish”. My recipe is a modification of the one made by Mimi in her book. I also added thinly sliced red onion, loads of basil leaves and fig vincotto, which I drizzled on before baking. It takes a bit of time to assemble but is baked in the oven and therefore easier than standing at the stove needing to stir a peperonata in a pot. And it is so colourful and impressive when served at the table. It is lovely eaten warm or at room temperature on a summer evening (or even winter if you are in the northern hemisphere). I served it with soft yellow polenta as a vegetarian gluten free meal a few days ago but it could be served as a side dish with chicken or fish. This is my last post for 2014. Grazie to every single one of you for reading my blog posts, making my recipes and leaving comments. You are what make blogging so enjoyable and rewarding. Onwards and upwards for 2015! Buon anno a tutti!! First slice the eggplants in rounds approximately 5mm thick. Scatter on some salt and place on a colander or drainage board to allow some of the liquid to drain. Slice the tomatoes and zucchini 5mm (1/5 inch) thick and set aside. Peel and slice a clove or two of garlic and set aside. Preheat the oven to 200C/390F. Now prepare the baking dish (mine is a deep ceramic dish 24cm or 9.5 inch square) – drizzle on a bit of olive oil then cut a clove of garlic in half and rub it all over the dish. Now it is time to arrange the vegetable layers. Wipe dry the eggplant slices first, removing the excess salt with paper towels. Alternate slices of tomato, eggplant, zucchini and onion slivers and place them in the dish upright. You might like to assemble three rounds (so 12 slices in total) before you start arranging them in the dish as they are tricky to get to stand upright to start with. I also put basil leaves every now and then (after every 8 or so slices of vegetables). I wasn’t too precious about the alternating layers – some had onions and some didn’t. As long as you have the pattern of the three colourful vegetables, it will look lovely. Keep going until you fill up the baking dish. Scatter slices of garlic on top, salt and pepper to taste, some olive oil, vincotto and some basil leaves or stalks if you like. Bake for 45-60 minutes until the vegetables are tender but still maintaining their shape. Scatter on some fresh basil leaves for garnish and more vincotto if you like. This looks great…can’t wait to try it. Thanks. What a beautiful dish! Buon anno a te! These dishes look delicious. I will remember the recipe when summer comes back here. Re. your zucchini plants: try and have them grow vertically along a stick planted in the ground. That’s how we do it in summer to avoid them taking over too much space. Simply stunning-Happy New Year to you! This really does look stunning. Funny to be drooling over these summer colors when it’s freezing outside here in the northern hemisphere! When i write posts i do think about readers in the north and how it is the opposite season and the produce is different – can’t do much about it except hold back posts for 6 months and that would be a bit weird. Glad you can still drool though Frank! You are right… this is a stunning peperonata!